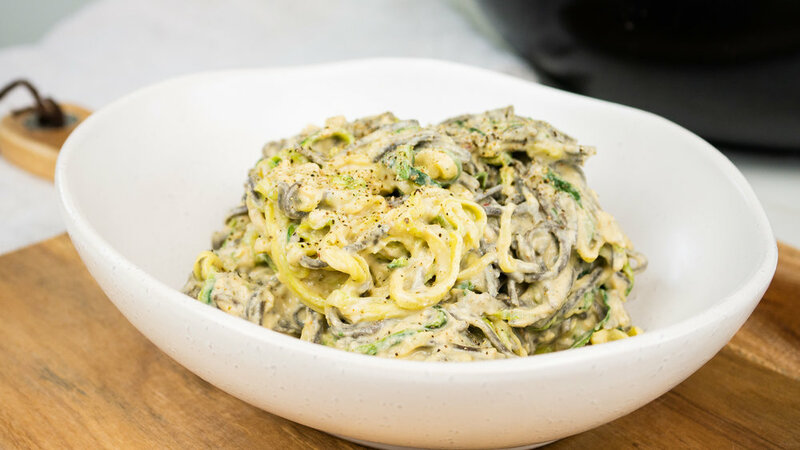 This zucchini carbonara is deliciously and creamy while being gluten-free and dairy-free! It's a family friendly meal that the kids will the enjoy too ðŸ˜Š. P.s. Here is what I use to make my zucchini noodles. I bought it from Pak'nSave for about $20. Cook the black bean pasta according to packet directions. Be careful not to overcook them as they may break up when added to the pan. In a blender or food processor blend together the water, cashew nuts, nutritional yeast, paprika, salt and mixed herbs. Pour the sauce into a bowl and whisk in the egg. Set aside. In a large pan or wok, heat the coconut oil and on medium heat and cook the onion until soft. Add the zucchini noodles and garlic and cook for another 1-2 minutes. Add the black bean pasta and sauce then cook for 2-3 minutes until heated through and the sauce has thickened. The egg will help the sauce to thicken up.